Monumental and yet grippingly intimate, Bach’s St Matthew Passion tells the story of Christ’s last days with music of aching beauty, that speaks of heartrending sorrow and timeless hope. Sung in German with English surtitles. We’re delighted to give our traditional Good Friday performance at Symphony Hall. This concert is also part of THSH’s Birmingham Classical season. Discounts vary. 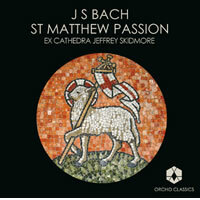 You might also like our performance of Bach’s St Matthew Passion at the St John’s Smith Square Holy Week Festival in London, 17 April 2019.